The Adapt-IQV by Mimo is not a consumer tablet, but a tablet thoughtfully designed for commercial use where running 24/7 is crucial. 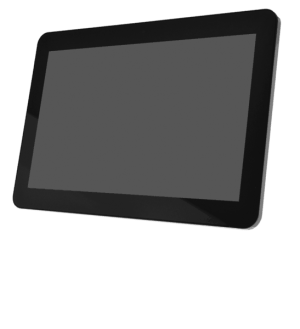 With hardware designed for commercial and retail use, added features such as robust case, tempered glass, design and testing for 24/7 use, VESA mounting, SD card protection system, stereo audio output, our tablet is the best Android solution for the demanding commercial and retail environment. The Adapt-IQV utilizes the security of wired with optional power over Ethernet OR the convenience of wireless Ethernet connections. Designed for fixed applications where a rugged mountable Android tablet is desired and where battery power is not required. 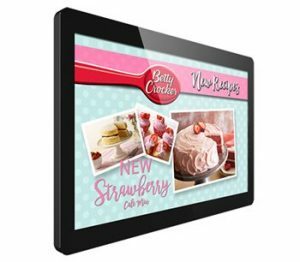 The Mimo Adapt-IQV tablet is designed to enhance the customer experience and provide the most cost effective solutions for retail POS/POP, commercial, industrial, and hospitality markets. Perfect for end-cap displays, kiosks, or as a customer-facing display in retail POS/POP environments. The Mimo Adapt-IQ tablet is designed to enhance the efficiency of the company meeting room by offering an easy to read LED system. With built in LED’s on the border of the Monitor, it will be simple to read the occupancy and schedule of the room. The Adapt-IQV is designed and supported as a long term commercial product. The external specifications and tooling are controlled to ensure a long product life, which is crucial for maintaining continuity for all phases of project rollouts and service. The internal assemblies were developed for the Adapt-IQV and are not subject to obsolescence. While internal components have changed for the better, this can be done without modification by the end user. The tablet uses a quad core Cortex A17 chipset with a 1.8GHz peak frequency that supports the latest ARM processor optimized package. Apps launch instantly and run smoothly. The processor features a quad-core GPU, so that all graphic-intensive apps are fluid and lifelike. All this, combined with 2GB of dual-channel DDR3 memory, distinguishes our tablet from other solutions.